During the year 2016, the LATAM Group operated a fleet comprised of 329 aircraft averaging approximately 7 years old, standing out among the newest in South America and the world. One of this year’s milestones was the launching of the unified LATAM Brand. As of December 2016, the Company had 43 aircraft already painted with the new logo; a progressive process expected to be completed in 2018, the year in which we project having the entire fleet designed with the new corporate logo. It is worth noting, however, that painting each aircraft takes an average between 6-12 days and that this operation is performed during each aircraft’s routine maintenance work in order to optimize the efficiency of the entire process. During this period, the Company continued to make progress in its fleet renewal plan, incorporating larger and more modern aircraft, while gradually disposing of the older models. In total, 23 aircraft were withdrawn and 24 new and more efficient models were incorporated, allocating them as most appropriate for the respective markets in which they operate. In order to develop its short-range passenger operations (domestic and regional flights within South America), LATAM operated 243 aircraft, all of them of the Airbus A320 family. We received 11 Airbus A321 aircraft (the largest version of this family), totaling 47 aircraft of this operating as of this year’s closing. In the medium term, the Company is aiming at operating a short range fleet of only the A320 family, in its A320, A321 and A320neo versions. In 2016, we received the first two aircraft of the latter type, thus becoming the first A320neo operator in the American continent. With a seat capacity for 174 passengers and an Airbus Space-Flex cabin configuration, LATAM expects to receive five additional such aircraft during 2017, from a total order portfolio of 34 aircraft. These aircraft incorporate state-of-the-art technology that includes new generation engines and sharklets (advance technology devices installed on the wings, designed to reduce aerodynamic resistance), permitting fuel savings of up to 15% and a resulting reduction in annual emissions of about 3,600 tons of CO2 per aircraft. 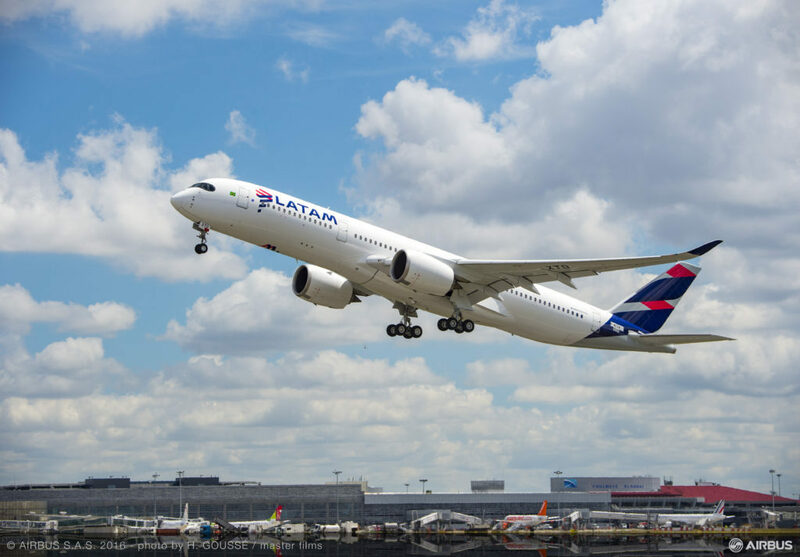 In order to service its long-range flights, the LATAM Group used a fleet comprised of 76 aircraft during 2016; noteworthy among which was the Boeing 787 Dreamline in its versions 8 and 9, in addition to the new Airbus A350-900. The wide-body fleet plan is aimed at a renewal in order to incorporate the best technology and become leaders in terms of efficiency, reducing the number of aircraft but increasing capacity through larger models. In effect, during this period we incorporated five Boeing 787-9 aircraft, among whose advantages stands out its greater capacity, both in terms of passengers (+27%) and cargo volume (+23%), as compared to the Boeing 787-8. Designed for 313 passengers (283 Economy seats and 30 Premium Business seats), the Boeing 787-9 burns up to 20% less fuel than similar aircraft dropping its CO2 emissions by up to 20%. As of December 2016, LATAM’s Boeing 787 Dreamliner fleet included 12 Boeing 787-9 and 10 Boeing 787-8 aircraft. Additionally, in 2016 the Company incorporated six Airbus A350-900 aircraft, adding seven units of this model by the closing of the year. The Company received the first such aircraft in December 2015, then becoming the first airline in America to operate it and the fourth worldwide. Designed for 348 passengers, 318 in Economy and 30 in Business Premium, the Airbus A350 is a medium-sized high-technology product; noteworthy for having a 25% lower CASK, as compared to similarly sized aircraft, such as the Airbus A330, and an equivalent drop in CO2 emissions. It should be noted that during 2016, LATAM ceased to operate the Airbus A330, a model that was fully removed from the fleet. In the meantime, in order to develop its cargo operations, the Company closed the year with an operating fleet of 10 aircraft (one less than operated in 2015), comprised of eight Boeing 767-300F and two Boeing 777-200F; the latter being the most modern dedicated freighter of its type in the industry. Since the focus is now placed on optimizing the bellies (storage space) of passenger aircraft, LATAM has been gradually reducing its dedicated freighter fleet. Along such lines, during 2016 the Company maintained a lease contract for three of its Boeing 767-300F freighters and one Boeing 777-200F to cargo operators out of the region. In response to the macroeconomic slowdown and the ensuing demand for air travel, LATAM continued to move forward in its plan to reduce the fleet, through postponements and sales of both its long as well as its short-range aircraft, with the main objective of adjusting its overall capacity to prevailing market conditions in the Latin American market. Within this context, in March 2016, the Company managed a US$ 2.9 billion drop in its fleet commitments for the period 2016-18; which represents a 37% drop in this respect during the last year. During 2016, the Company made significant progress in its plan to reduce total fleet assets and fleet commitments, reaching the lowest fleet commitment levels in the recent history of LATAM for 2017 and 2018. LATAM reduced its fleet commitments through deferrals and cancellations, and it will also reduce existing fleet assets by returning additional aircraft as compared to the previous year fleet plan. With this, the Company will have reached US$2.2 billion reduction in fleet assets for 2016–2018, in line with our previously announced plans to achieve a decrease of US$2.0 to US$3.0 billion in our expected fleet assets by 2018. The Company’s major, line and component maintenance facilities are duly equipped and certified to look after its entire Airbus and Boeing fleet. With facilities in Brazil (Sao Carlos) and Chile (Santiago), the LATAM Group’s Maintenance, Repair and Revision Unit is responsible for major maintenance of the Group’s aircraft; occasionally, it also does maintenance to third parties. Both of them provide 76% of the Company’s total major maintenance requirements, while those that are not performed internally are contracted from among MRO’s (Maintenance & Repair Organization) vast worldwide membership network. This unit is also responsible for the planning and execution of aircraft returns. The Brazil MRO, which includes its own engineering and support capabilities and a full technical training center, is indeed prepared to look after up to eight aircraft simultaneously, with a specially-dedicated extraction and painting hangar. This facility is also equipped with 22 technical component shops, including a full repair shop to check landing systems, hydraulic, electronic and pneumatic equipment, electroplating, composite materials, wheels and brakes, interiors and emergency equipment. Moreover, it has its own exclusive 1,720-meter runway. The Santiago MRO, located in the vicinity of the Comodoro Arturo Benítez International Airport, is equipped with two hangars capable of simultaneously servicing one wide-body and two narrow-body aircraft. It is also equipped with eight workshops ready to provide support to the hangars, with the cabins, galleys, composite structures and materials, and also to adapt aircraft interiors, including IFE (In-flight entertainment) systems and winglets. On the other hand, our line maintenance network provides a range of full maintenance services to aircraft in order to ensure that the fleet is always operating safely and according to all local and international regulations. LATAM strives to provide the best experience to its passengers with the highest standards in terms of on-time-performance and cabin image. In 2016, our line maintenance network effectively used more than 2.1 million man-hours in both preventive as well as corrective tasks to LATAM’s fleet. The Company also resorts to certified third-party services that are economically convenient; such as in Frankfurt, where its aircraft is looked after by Lufthansa Technik; in Milan, by Air France-KLM; and in Johannesburg, by South African Airways. It is worth highlighting that ever since the year 2010, LATAM’s maintenance has transformed production and support processes by means of the LEAN Methodology, which has translated into an automation and integration of processes, improving both the levels of productivity of the technical teams as well as response times when confronting contingencies, in addition to simplifying and strengthening the maintenance processes, making them more scalable and visible to the entire organization. Along with the development of these data-processing systems, in 2016 we handed out 300 iPads to the Brazil maintenance network, in addition to the other 300 iPads delivered to the Spanish-speaking countries during 2015, in order to improve maintenance connectivity in the field. The Company also has its own hangar (built in 2015) at the Miami International Airport. This city represents a strategic geographical advantage in order to secure supplies and services, as well as to gain access to a broader range of suppliers to cover more complex maintenance tasks. The hangar and the surrounding structures comprise an area of over 66,000 square feet and involved a US$ 15 million investment. Note: This table includes three B767-300F that Latam is currently leasing to a third party, does not include two B777-200F (one currently leasing to a third party), three A330 and one A320 that were reclassified from property plant and equipment to held for sale.